The calf anatomy includes the gastrocnemius (aka “gastroc”) and the soleus. Get ready to learn about both of these muscles, their locations and their functional anatomy. This page provides an overview of the calf muscle group. Discover more information about the calf anatomy by clicking the links throughout the page. The calf contains two main muscle – The soleus muscle and the gastrocnemius muscle. The soleus and gastrocnemius work in tandem to carry out the function of plantar flexion. Plantar flexion is just medical terminology for the movement of pointing/pressing the ball (front part) of your foot downwards. You perform plantar flexion when standing on your tippy-toes, pressing (or flooring) the gas pedal of a car, walking, and of course, when performing calf exercises. The gastroc extends from the femur (thigh bone) down to where it inserts into the Achilles tendon. 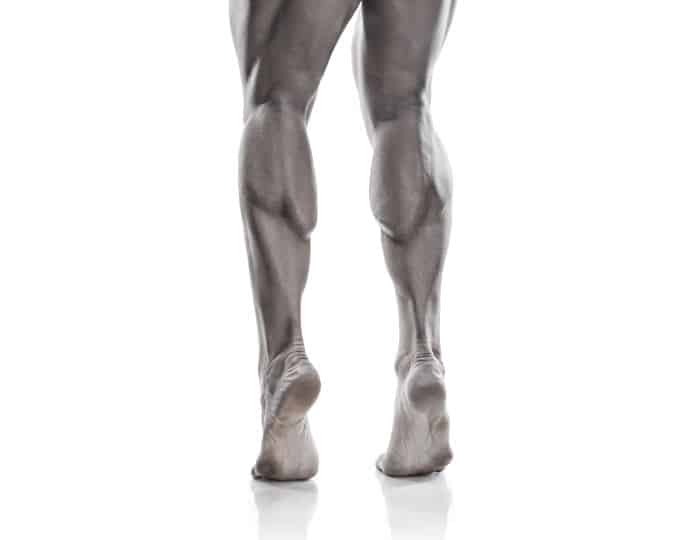 The gastrocnemius is much larger than soleus, accounting for the nearly all of visual bulk of the calf anatomy. Fast Twitch Muscle Fibers. The gastroc is made up of mostly fast twitch (Type II) muscle fibers. Fast twitch muscle fibers forcefully contract to produce explosive movements, but experience rapid fatigue. They are utilized during anaerobic activities, such as high intensity (very heavy) weight training and sprinting. Assists Knee Flexion. The gastroc plays a small role in knee flexion. So it is essentially untrained during any calf exercises where the knee is bent, such as seated calf raises (the soleus does all the work). As you can imagine, it would be a major mistake to do a calf workout with only bent-leg exercises. Gastrocnemius exercises include any calf exercise where the leg is straight, such as the standing calf raise or calf press. The soleus extends down from the tibia and fibula to where it is attached to the Achilles tendon. It’s much smaller than it’s good friend, the gastrocnemius. But not to discount its aesthetic importance, a well-developed soleus muscle does have a some noticable visual impact on the calf, despite being located underneath the gastroc. Slow Twitch Muscle Fibers. The soleus primarily consists of slow twitch (Type I) muscle fibers, which are highly fatigue resistant. This means that they are utilized for aerobic and endurance-type activities that range from maintaining posture, walking, jogging, or long-distance running. Slow twitch fibers cannot produce the forceful contractions required for creating fast and powerful movements. Ankle Stabilizers. As I mentioned in the previous bullet, one function of slow twitch fibers is to maintain posture; and the soleus does just that. Its most obvious functional purpose is to maintain posture by stabilizing the leg’s connection to the foot. Without it, we would all be constantly rolling our ankles, if not completely immobilized. As I mentioned earlier, the soleus is isolated when the knee is bent, as is the case with the seated calf raise. Although the Achilles tendon is not actually a calf muscle, it does directly connect to both the soleus and the gastroc. What’s important to know about the Achilles is that it can act like a spring. Put differently, it can store a lot of energy and then output the energy with minimal help from the muscles (a.k.a. elastic recoil). In terms of calf exercises, elastic recoil allows you to perform reps with a lot of weight by “bouncing” the weight. For example, if you perform a seated calf raise – by lowering the weight too quickly and not pausing at the bottom – you do not work the actual calf muscles. Rather, the Achilles’ elastic recoil effect carries you through the motion of a repetition, but does not contribute to any muscle growth or strength increase.